Interested in Cold Call Features with reporting Capability? How about Geographic search and radius search capabilities? Do you need a software that gives you Financial Analysis and comparison tools as well as Client reports? Are you looking for a CRM that will provide not only good features but amazing online and over the phone technical and customer support? Look no further! Ability to filter from any field by just the right click of a button on that field! Duplicate merge feature for contacts and properties by using our Data Doctor! 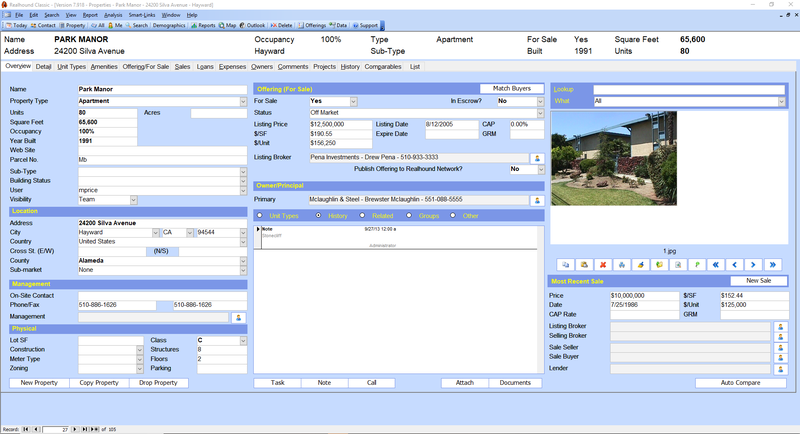 Import multiple contacts and properties and multiple photos per property! Custom reporting function for financial and comparison analysis. Free technical support, online training videos and customer support! Have the ability to blog about properties, request bids and see other properties Realhound users are blogging about all Integrated into the solution, not having to go out to a third-party site. Cold calling features, Dynamic searching capabilities, document management, buyer or tenant matching, client ready reports, marketing campaign activity reports, access via the internet, and so much more! With so many contacts and properties how can you keep track of who works where and who is associated with each property? With Realhound’s app at the palm of your hand you’ve got all your properties and contacts linked together and easily accessible. Functional and attractive design for ease of access to any user. add properties and contacts on the go and sync with our web and classic applications to keep your team mates updated! When you update any record your team will have that update immediately on their devices!